Jim and Mark Russell were out on a fishing charter here in Naples with us this week and caught king mackerel up to 40 pounds, two Goliath Grouper over 200 pounds, an eight foot long bull shark and a six foot Blacktip Shark. After catching all these fish off of one spot they and their father and grand father had enough, and came home early and exhausted. 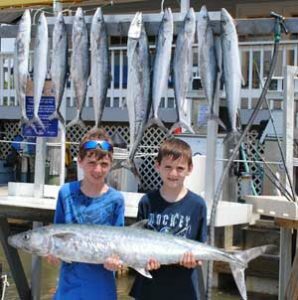 Spring fishing is the absolute best time for variety and numbers of fish in the Naples and southwest Florida area. As the weather heats up the fishing keeps getting hotter.